A beekeeper from Vojka, Serbia making a bee hive frame. Beeswax (Cera alba) is a natural wax produced by honey bees of the genus Apis. The wax is formed into "scales" by eight wax-producing glands in the abdominal segments 4 through 7 of worker bees, who discard it in or at the hive. The hive workers collect and use it to form cells for honey-storage and larval and pupal protection within the beehive. 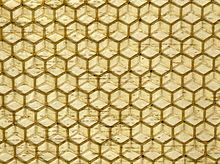 Chemically, beeswax consists mainly of esters of fatty acids and various long-chain alcohols. 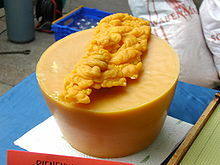 Beeswax has applications in human food and flavoring, for example as a glazing agent. It is edible, in the sense of having similar negligible toxicity to plant waxes, and is approved for food use in the European Union under the E number E901. However, the wax monoesters in beeswax are poorly hydrolysed in the guts of humans and other mammals, so have insignificant nutritional value. Some birds, such as honeyguides, can digest beeswax.